CT bone densitometry and calibrated calcium scoring are poised for change with the introduction of new calibration methods. 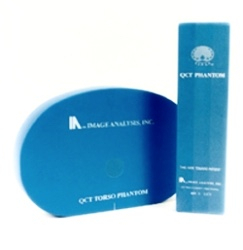 Image Analysis has sold more QCT Calibration Phantoms than anyone and continues to lead with innovations in CT calibration with a new, patented design. 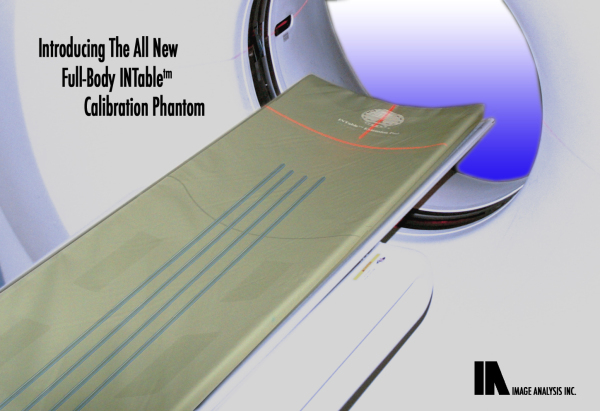 The INTableTM Calibration Pad is intended to replace existing CT couch pads and to remain in place on the CT scanner. 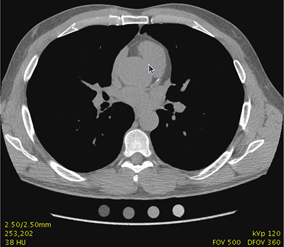 The small cross sectional samples do not interfere with other CT exams. Simultaneous phantom calibration is available on all CT slices and all CT scans. The small (round) samples virtually eliminate streak artifacts, scatter, beam hardening, and the increased dose and noise of the older, larger QCT Calibration phantoms. The hassles of phantom and patient positioning and misalignments of the larger "on the table, off the table" phantoms are eliminated. ​With the new Image Analysis INTableTM Calibration pad, place it and forget it. The technologist need no longer be concerned with phantoms. Any scan, any time, any patient is available for BMD or calibrated Calcium Scoring now or in the future. DIMENSIONS: The Calibration pad is 51 in. (129 cm) long, and 16 in. (41 cm) wide. The contoured pad will fit all modern CT tables. Each sample rod is 0.625 in. (1.6 cm) diameter and 50 in. (127 cm) long. An extension pad is provided to cover the full scanner table. CT-WaterTM: The base material is composed of our proprietary CT water equivalent solid compound. Water equivalence is at the level required for CT such that the HU number is very close to true distilled water. CALIBRATION SAMPLES: Four sample concentrations of 0 mg/cc, 75 mg/cc, 150 mg/cc of calcium hydroxyapatite homogeneously (CaHA) blended into the CT-WaterTM compound. The fourth sample is fat equivalent. (Iodine samples will be an option in the future). Each phantom sample is homogeneous and stable for long-term use. Calcium hydroxyapatite is the major component of human bone and vascular calcifications and has become the accepted standard for bone densitometry and calcium mass scoring. The Image Analysis proprietary software automatically finds the calibration samples on all slices and provides automated calibrations for either Calcium Scoring or Bone Densitometry. A Hybrid Calibration software program is also included that uses blood/muscle for scanner standardization. This calibration method eliminates the need for QA phantom scans and the uncertainty of cross calibration with scanner upgrades. Each phantom sample is QA tested and verified in manufacturing to provide confidence in your clinical reports. Image Analysis: Improving the future of CT Calibrations for Bone Densitometry and Calcium Scoring. - Gone is "on-and-off" the CT table placement and storage of older large, bulky calibration phantoms. - Gone is patient discomfort from the large and hard edges of older phantoms. - Gone is the hassle of positioning, aligning and repositioning of phantoms. - Gone is the misalignment of the phantom when a patient shifts or moves. - Gone are artifacts and measurement errors from scatter, beam hardening and attenuation that can occur with the older, larger phantoms. - Gone are bolus bags and QA phantoms and scanner standardizations and cross calibrations with CT upgrades. -Couch Pad: The couch pad houses the phantom and facilitates patient comfort and phantom/patient coupling. -QA Torso Phantom: Allows CT scanner performance evaluation for QCT measurements, system accuracy and reproducibility. -Bolus Bag: A gel filled, water equivalent blousing bag for placement between patient and phantom. The Image AnalysisTM Solid Calibration Phantom is manufactured with bone-equivalent calcium hydroxyapatite incorporated into our solid, tissue-equivalent material (CT-WaterTM). Calcium hydroxyapatite is the major constituent of human bone and vascular calcifications, and has been the accepted bone mineral standard for several years. Image AnalysisTM has further improved on phantom calibration by developing a hybrid calibration method that uses blood as an additional in vivo calibration reference. With the many scanners, reconstruction algorithms and field flatness techniques, the internal and centrally located blood sample provides an additional reference for calibration and standardization across different scanners and patients. Blood is highly homogenous within a patient and very consistent in composition across different patients. This hybrid calibration provides a consistent and highly accurate method for the measurements of density and mass of vascular plaques that can be standardized across scanners and patients. - Solid phantoms provide long-term reliability and highly reproducible measurements. - Calcium hydroxyapatite - the reference standard of most bone densitometry devices. - Reduced cross-sectional size of the calibration phantom. Lightweight, easy to position, well tolerated by patients. - Reliability backed by a Lifetime Warranty. - The calibration phantom is contained in a couch pad for patient comfort. Markers are provided for alignment and ease of positioning the patient.